The Los Angeles Chargers on Saturday evening were limited to their fewest points of the season by the Baltimore Ravens league-leading defense in a 22-10 loss at StubHub Center, seriously damaging their hopes for the AFC West title. Justin Tucker kicked three field goals and rookie quarterback Lamar Jackson threw a 68-yard touchdown pass to Mark Andrews in the third quarter as the Ravens (9-6) won for the fifth time in six games since the 2016 Heisman Trophy winner replaced an injured Joe Flacco as the starter. Baltimore sealed the victory when linebacker Patrick Onwuasor, an Inglewood High alumnus, punched the ball out of Antonio Gates’ hands just before his right knee hit the ground. Tavon Young recovered the loose ball and ran 62 yards for a touchdown with two minutes, 40 seconds to play. Philip Rivers completed 23 of 37 passes for 181 yards and two interceptions as the Chargers four-game winning streak ended along with Rivers’ 27-game streak of throwing at least one touchdown pass, one short of his franchise-record set in 2012-14. Rivers’ interceptions came on the Chargers first and last plays of the game. The interception by Brandon Carr on the first play of the game led to a 24-yard field goal by Tucker. Marion Humphrey intercepted a Rivers pass in the end zone with 1:21 left. The loss means the Chargers (11-4) would have to win their regular- season finale Dec. 30 at Denver and Kansas City would have to lose both of its final two games for the Chargers to win the AFC West. The Ravens entered the game allowing a league-low 18.07 points and 290.2 yards. They became the first team to hold the Chargers under 20 points this season. The Chargers 10 points were their fewest since Sept. 17, 2017, when they lost to the Chiefs, 24-10. The Chargers were held to a season-low 198 yards and a season-low- equaling 14 first downs. They also had 14 first downs in a 20-19 victory over the Tennessee Titans Oct. 21. With Jackson completing 12 of 22 passes for 204 yards and running for 39 yards on 13 carries and fellow rookie Gus Edwards running for 92 yards on 14 carries, the Ravens outgained the Chargers 361-198 and led 15-14 in first downs and 31:25-28:35 in time of possession. The Chargers led for one minute. They took a 10-6 lead with 13:18 remaining in the third quarter on Melvin Gordon’s 1-yard run, three plays after Melvin Ingram recovered Kenneth Dixon’s fumble at Baltimore’s 21-yard line, ran for three yards, fumbled, then recovered his own fumble at the 17-yard line. Jackson threw a 68-yard touchdown pass to Andrews with 12:18 to play in the third quarter. Tucker kicked a 56-yard field goal on the Ravens next possession, increasing their lead to 16-10. 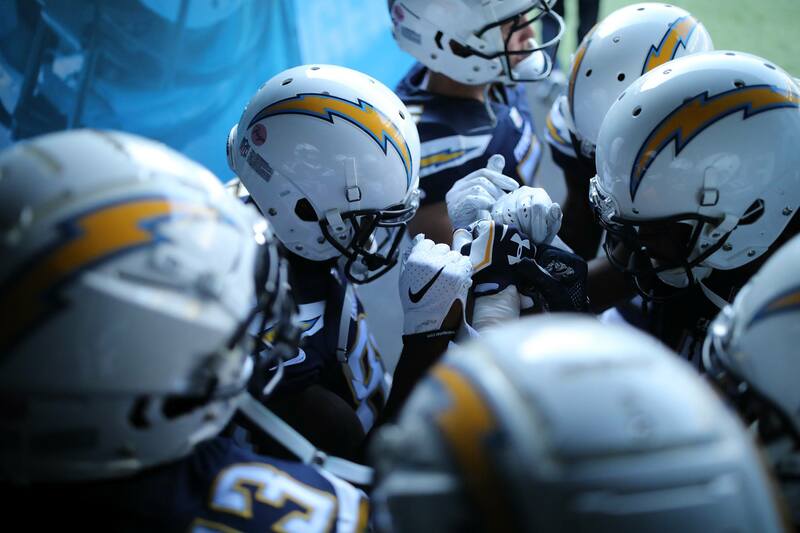 The Chargers trailed 6-3 at halftime before a crowd announced at 25,571. Tucker kicked a 35-yard field goal 2:50 before halftime. Michael Badgley kicked a 38-yard field goal for the Chargers with 40 seconds left in the first half on a nine-play 56-yard drive that also included pass interference and unnecessary roughness penalties, both for 15 yards, against Baltimore. The Ravens hold the AFC’s second wild-card spot. They would win their first AFC North title since 2012 with a victory over Cleveland in their regular-season finale Dec. 30 and a loss by the Pittsburgh Steelers in one of their final two games.